If you're in the beauty industry like me you feel like Sundays begin your weekend and one of the things I like to do (if I don't have a wedding) is to spend my evening pampering myself in celebration of the week ending and in preparation for Monday (usually my office day). 1. Mask: I love Glam Glow SuperMud Clearing Mask to really detox my pores and since I rarely wear makeup on Mondays, it's effects get a solid two days to settle in. 2. Stretches: Most of you close to me know my lower back is rubbish and this year after two massive bouts of back trouble I started Pilates with the extraordinary Susan from Austin Girl Pilates. She has taught me some stretches to do daily and on Sundays I take a solid 30 minutes to dedicate to this routine. 3. Soak: There's a magnificent brand called Therapie Himalyan Detox Salts which has the most amazingly relaxing scent and makes my muscles feel loose and soothed. 4. Manicure: I am meticulous about my finger tips. Whether I wear polish or not, I like them short, neat and clean so I always give myself a proper manicure. I rarely do my pedicure myself... since I work on my feet most days I gift myself that treat every month and leave it to the professionals. 5. Hair Treatment: I sleep with a treatment in at least once a week and currently I'm loving Bumble & Bumble Hairdresser's Invisible Conditioner. SIDE NOTE: During the week I use Living Proof Night Cap. It's that time of year again where many engagements happened over the holidays and depending on when you set the date, some of your beauty needs will need a few months of preparation so I have a comprehensive list for you to refer to as you move forward with the rest of your wedding planning. Are you booking a professional hair and makeup artist for the big day? If so, remember, the good ones book up quickly and you will want to have a contract with your artist 3-6 months before the wedding date. Another necessary step that needs to happen 3 months before the wedding is a brow consult. I would strongly recommend visiting your local Nordstrom Anastasia Brow Studio to get some guidance on the best shape for your face. Since a hair cycle is typically 4-5 weeks, this guideline will allow you to have 3 appointments leading up to your wedding day, allowing for any grow out or correction necessary. Are you planning to do a hair/makeup trial? I suggest if your schedule allows, doing the trial the morning of your fitting, this way not only will you see how the hair and makeup look with your dress, you will also see how it photographs and how the hair and makeup wears through the day. You're looking for everything to stay in tact for 8 hours minimum. Keep in mind if you had both done at 11am and it doesn't last til midnight with all the dress trying on and running around, that's fine. You need to look perfect for the photos and the wedding, anything beyond that is a bonus! Lashes are another aspect that you should consider. For close up photos, individuals are preferred because they appear far more natural then strips although they are a little more difficult and time consuming to apply but lashes (as well as brows) seem to look much weaker and sparse with professional photography flash and this will make it look like you have fluttery natural lashes in all of your photos. Another factor to consider for close ups is your skin, now yes, you can pay your photographer to Photoshop your skin making it flawless but wouldn't you rather look flawless to your fiance, wedding guests and in your photos on your own? This can be as simple as deep cleansing or hydrating facials 4-8 weeks before the wedding or laser work 3-6 months before. Depending on your needs you can choose your route with your Esthetician or Dermatologist but either way, keep your routine simple, don't introduce any new products within the last 3 weeks and be sure to clean your skin well before bed and exfoliate regularly... this will ensure a natural glow not digitally enhanced. Are you having bridesmaids? The number one thing I hear is that after the cost of the dress, shoes, flights, hotels, etc., your girls' paying for their hair and makeup get 86'd. My suggestion is consider letting them pay for their hair and you figure in their makeup into your wedding budget. After all they are YOUR photos and YOUR album that you will have forever so it's more important than the 7 varieties of hors d'oeuvres that you are mulling over. Are you planning to spray tan? You definitely should have a trial run with the tanner before the day so you can make sure you are hiring the best sprayer and you are happy with the quality and wear of the solution you choose. St Tropez is amazing and I recommend it! Will your dream hair style require extensions to achieve? If so then you will want to order them after you have decided on your final hair color/cut for the wedding and in time for you to take them with you on your last hair appointment just to double check the shade. If your wedding day hair professional is great at her craft, she will know before your trial whether you need extensions to achieve the look you're going for and if so, she may even have a sample set to use at your trial so you can see the full effect. Are you opposed to highlights? Highlights really enhance a hairstyle whether it is up or down and if you aren't willing to commit to permanent highlights, keep in mind you can use extensions in a lighter shade to give you temporary lightness for the day. Manicures/Pedicures are essential and we all know that but I want to talk to you a little about shade selection. If you are traditional then go with a pale pink shade like Essie Mademoiselle, Deborah Lippmann La Vie En Rose but steer clear of a french manicure. It is very dated and you can do better. If you are more edgy think outside the box and go with a lovely greige color like Essie Chinchilly, OPI Tickle My Francy or Metro Chic by OPI for Sephora. If you are trendy then look at what's hot right now... is it red, bold pink or metallics? Any of those will photograph well but stay away from super dark shades or nail art as it will be distracting in your photos. 1. A few drops of the AMAZING Deborah Lippmann Cuticle Remover is incredibly effective at eating away what's grown since your last mani allowing you to remove very little with your cutters. 2. Recently I replaced my faithful orange wood stick with a metal Sally Hansen pusher! Quickly pushes cuticles back into the perfect shape in seconds. 3. Snip away any lifted cuticles with my Tweezerman Cuticle Nippers. My pair is over 10yrs old & still hasn't required sharpening. 4. Follow steps 1-3 listed on your handy dandy buffing block. 5. Create your perfect shape with a perfectly gentle Deborah Lippmann file. 6. Lastly give your hands the nourishment & sun protection they deserve with Deborah Lippmann Rich Girl SPF25. Remember ladies, we show our age in our hands so NEVER skip this step but if you're going to finish with a polish, wait to apply until nails are dry... Lotion residue on the nail causes polish not to adhere, chipping almost immediately. * If you accidentally get a little lotion on your nail beds then use a nail cleanser like Deborah Lippmann 2 Second Cleanser or the similar product made by Sephora X. Even though I love a product as much as the next beauty guru I'm really bad about doing multiple steps at night. 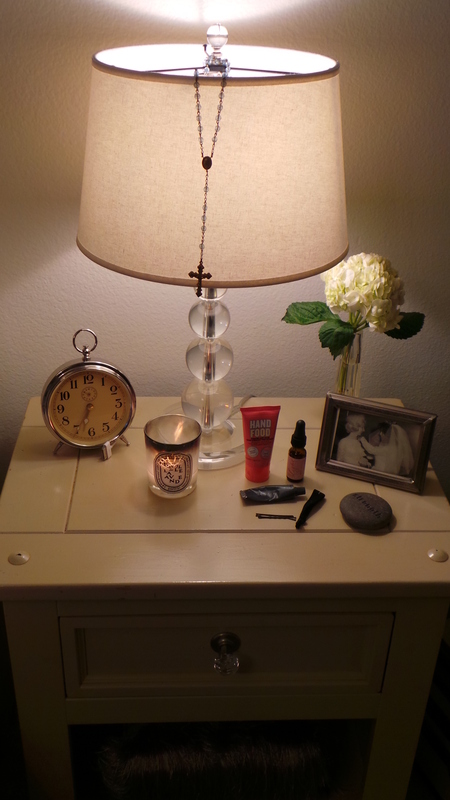 My cleansing routine is long enough I feel but I do recognize that you have to pamper more than your face so this is the little system I keep at my bedside to help encourage me to take care of the rest of me. Diptyque Lavende Candle: I actually would not repurchase this candle because once I blow it out, the smell of the wick is so intense it spoils the beautiful aroma that just took a few hours to create. I prefer candles that have a lid so I can close the smoke inside the container. Soap & Glory Hand Food: I love body lotions but I hate when my hands feel sticky or greasy so I typically never apply hand lotion. I learned about this one through one of my favorite YouTubers, Tanya Burr and now I love it! It hydrates while somehow absorbing so quickly that it leaves no greasy residue behind. Josie Maran Light Oil: I originally purchased this for my face but can't seem to embrace it for that use so now I use it on my cuticles at night. Bite Agave Lip Mask: This product was forced upon me by my favorite sales girl at Sephora and I was resistant at first however because this is so thick it seems to last til morning which I love! If you have any suggestions for lavender or sleep related candle scents I would love to hear. Please leave a comment with your favorite night time scent or #BobbyPinsandBlush on Instagram with a photo of your night stand essentials.